The original route of the Appalachian Trail in Virginia crossed the Pinnacles of Dan, a hike described by hikers at the time as second only to Mt. Katahdin for its difficulty and beauty. 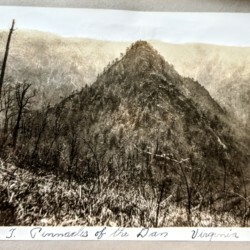 In 1952, the ATC moved the route of the Trail more than 50 miles north and west, abandoning this region of Southern Virginia and removing the Pinnacles from the Trail's route forever. Today the Pinnacles are accessible only by permit from the Danville water authority. This image comes from former ATC Chairman Myron Avery's personal scrapbooks in the ATC Archives. 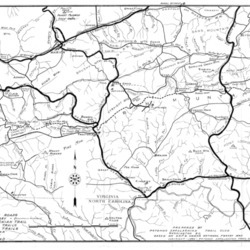 This map depicts the Appalachian Trail between Fries and Damascus, Virginia in 1941, including the crossing of the New River at Dixon's Ferry. This original route of the Appalachian Trail was abandoned in 1952, when the Trail was rerouted west into the Jefferson National Forest to the route it follows today. 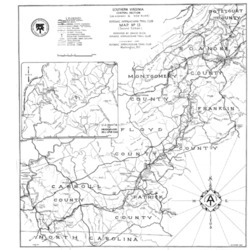 This map depicts the Appalachian Trail between Roanoke and Fries, Virginia in 1940, including the legendary stretch over the Pinnacles of Dan. This original route of the Appalachian Trail was abandoned in 1952, when the Trail was rerouted west into the Jefferson National Forest to the route it follows today.